The Moroccan Family Code is considered the top reform of 2004, and a model in the Arab and Islamic world. The House of Advisors unanimously adopted the new Family Code on January 23, 2004, after it had been adopted by the House of Representatives. The family law reforms, in harmony with the teachings of Islam, were seen as “revolutionary” and were largely welcomed in Morocco and worldwide. These reforms appeared in most national and international newspapers and news websites with headlines such as: “Morocco reform plan welcomed”, “Moroccan King plans women's rights reform”, “Family law change to end polygamy in Morocco”, “A King's Appeal”, “Moroccan women win more rights”, “Morocco's Family Code reform to mark a revolution”, and “Morocco could become women's rights model among Muslim countries”. 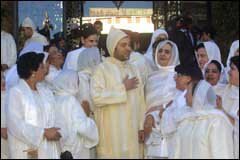 After years of discussion and controversy within the Moroccan society over the amendments that should be introduced in the Mudawana ratified in 1957, King Mohammed VI announced on October 10, 2003, on the occasion of the opening of parliament's fall session, reforms on issues related to marriage, divorce, custody, and inheritance. This new Family Code was unanimously adopted by the House of Advisors on January 23, 2004. The previous Family Code stipulated that the family was under the control of the husband, and that the wife's main marital duty was to obey her husband in all matters. The Mudawana, based on Islamic Sharia law, and ratified soon after independence in 1956 was widely abused in Morocco where illiteracy among women reaches more than 65 %, especially in rural areas. Thousands of divorced women are living in tragic conditions without any guarantees to ensure their rights and those of their children. In the late 1990s, there was a heated debate over improving women's rights in Morocco and revising the Mudawana. In March 1999, former State Secretary for Family Affairs, Saïd Saidi, introduced a bill known as the “National Action Plan for Integrating Women in Development.” This bill aimed at asserting some basic rights for women against discrimination and abuse. The plan, especially the section on reforming the Mudawana, faced fierce opposition from conservative and Islamist groups. This led to a massive protest rally in Casablanca, in March 2000 against any change in the Mudawana. Modernists seeking change marched in fewer numbers, the same day, to express their support for the plan. In May 2000, and in response to the intense public debate on women's rights, the ex-Prime Minister Youssoufi appointed a committee of twenty religious scholars, sociologists, judges, and one women's rights activist, to look into the controversial aspects of the plan, and make their recommendations to the King. This committee failed to address these issues and the plan was put on hold. Given widespread recognition of the need to improve women's rights as part of developing Morocco's overall human rights record, and to ensure that women enjoy a better, more equitable status, King Mohammed VI stepped in, setting up a Royal Commission, made up of Islamic scholars and women's representatives. It was meant to report in 2002, but the controversial and sensitive nature of the subject made it difficult to reach an agreement. By announcing reforms of the Mudawana to parliament on October 10, 2003, the monarch said he wanted to prevent society from splitting apart over this issue. As Commander of the Faithful (Amir Al Muminin), His Majesty stated that the aim of these reforms was to draw up a modern family law consistent with the spirit of Islam. “I cannot make licit what God has forbidden, nor forbid what he has made lawful,” he said. The new reform, proposed by the Royal Commission, would place families under the joint responsibility of both spouses. The family law would not be considered as legislation devised for women only, but rather as a code for the family: father, mother, and children. The proposed legislation was meant to free women from the injustices they endure, in addition to protecting children's rights and safeguarding men's dignity. Women have the right to ask for divorce, and the legal age of marriage for girls would be raised from 15 to 18; polygamy will not be outlawed but will be practically impossible; and custody of children in the case of separation is given as a priority to the mother. To ensure optimal conditions for the enforcement of the new family law, His Majesty addressed a message to the Minister of Justice, in which he explained that no matter what reforms had been proposed, their implementation would hinge on the setting up of a just, modern and effective family judicial system. In addition to the rapid establishment of a family mutual assistance fund, the King has ordered the Minister of Justice to set up suitable facilities for the administration of family justice in all courts of the Kingdom, and ensure that staff are trained, at all levels, and qualified to shoulder their future responsibilities. Efforts must also be made to reach deadlines laid down in the current civil procedure act to expedite family matters. A parliamentary commission debated the new code for one month, studying 110 amendments before submitting it to the House's vote. Eventually, the House of Advisors unanimously adopted the new Family Code on January 23, 2004, after it had been adopted by the House of Representatives.